I was told to visualise the plane as a matrix, and the plotted points were to be printed as asterisks on the screen. 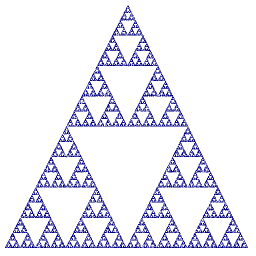 It’s been years now, and I still think the screen output of my Sierpinski Triangle sucked because of the low resolution. Now, older and wiser, I can come up with a better representation. Short and sweet. Instead of printing to the command line screen, I plotted the points to a bitmap. I still remember printing my program listing and the Sierpinski asterisks output. Though pleased with the required output, I thought it looked a little unrefined around the edges.